The “Old Duke” beer house, built by George Smith in 1853 changed hands a few years later, and Charles Atkins became the tenant. 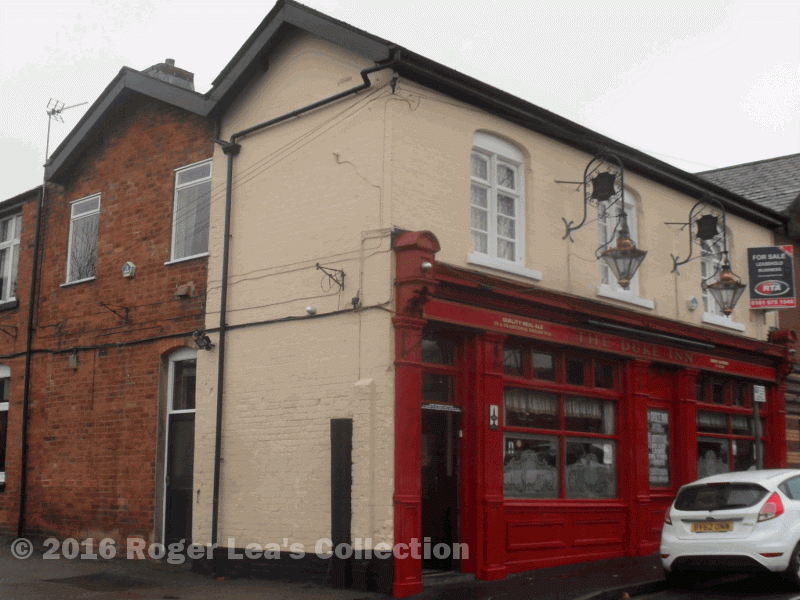 Atkins, his wife Mary and their two young sons moved here from London - he set up in the Old Duke as a retail brewer and grocer, no doubt having seen the tenancy advertised through his trade contacts. Business boomed at the Old Duke, and soon Charles Atkins needed larger premises. An opportunity for expansion soon presented itself. A house on the opposite side of the road, built for the Champion Jockey John Wells, was sold in 1859, a four-bedroom house with a large garden and extensive stables. It was purchased by James Hughes, a wealthy man living in High Street - “buy to let” is nothing new - and a few years later Charles Atkins took on the tenancy of this house and transferred his business across the road to it - the present-day Duke Inn. The original “Old Duke” was converted into a pair of semi-detached houses, since demolished. Charles Atkins kept the name “Old Duke”, but he was now a licensed victualler, so “beer house” became “inn”. Sarah Holbeche, who recorded Sutton goings-on in her “Diary” was passing Duke Street in 1868 and noted “The Old Duke has moved across the way and grown in importance”. The Inn flourished, taking advantage of the growing population in the locality. At a time when travel was either on foot, on horseback, or in a horse-drawn vehicle the extensive stables were a great asset. Charles Atkins bought the property and raised his family there - when he came from London in the 1850s he already had two young sons, and four daughters were born in the next ten years. After Atkins’ death ownership of the pub, now known simply as the Duke Inn passed to his widow Elizabeth, who became the licensee, described as a licensed victualler in the 1881 census when she was 57 years old. The Duke Inn remained in the ownership of Elizabeth Atkins until 1897, with a succession of licensees, Thomas Crudgington, Sarah Thomas, and John Short are named. In 1888 the Corporation rate book shows that William Read was renting part of the property, probably the outbuildings, as a “manufactory”: this was the beginning of “Read and Sons Royal Sutton Mineral Waters” which moved to a purpose-built factory on the corner of Lower Queen Street and Upper Holland Road shortly afterwards. John Harrison was the publican in 1894, and the inn flourished under his management; when ownership passed to the Holt Brewery in 1897 the new owners immediately set about building an extension to provide a taproom and increased cellarage. The pub was clearly popular with the local people with its links to the cricket and football clubs, but John Harrison’s full-page colour advert in the 1900 Sutton Directory (there were only four of these colour adverts) shows that he also hoped to attract the passing trade of cyclists and horse-riders on Birmingham Road. 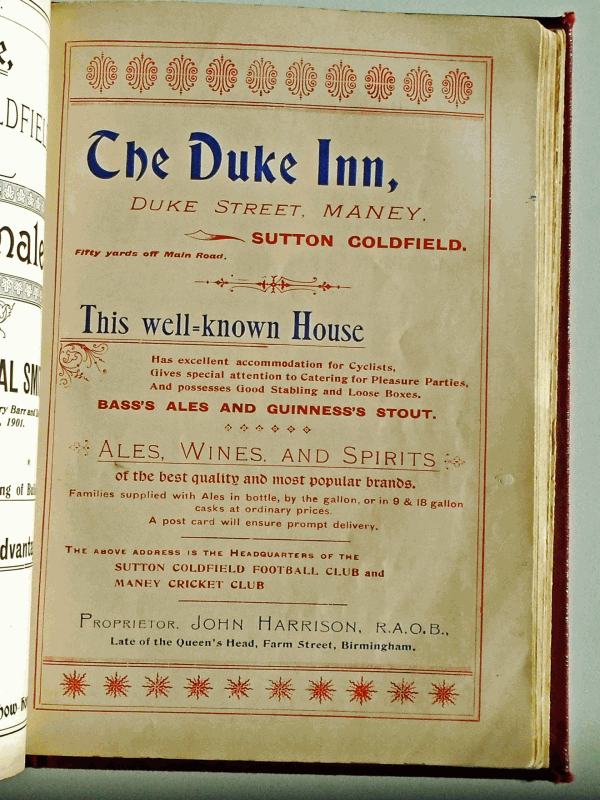 Advertisement for the Duke Inn in the 1901 “Directory of Sutton Coldfield and Erdington”.